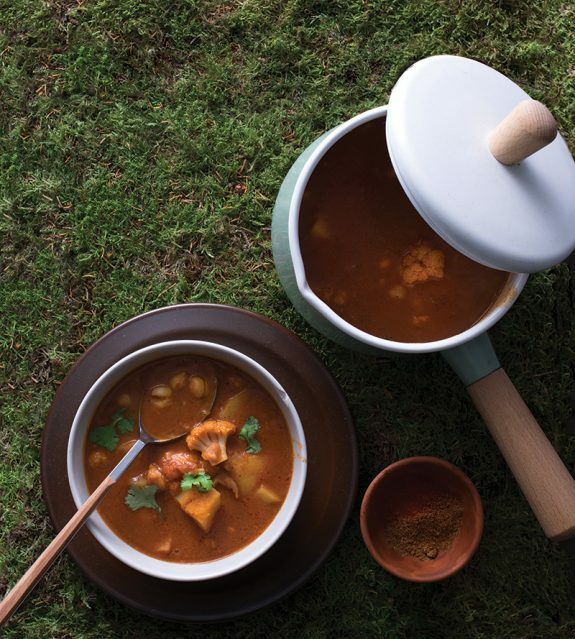 This stew centers on chickpeas, cauliflower, coconut milk and the beautiful spice blend of garam masala. Spice it up by adding cayenne pepper or red chili flakes. Simplify it even more using canned chickpeas. Boil chickpeas in a pan for 40 minutes. Drain. In the same, dry pan heat oil on medium heat and cook onions for 3 minutes until translucent. Stir in garlic, paprika, garam masala and cook for 1 minute or so until fragrant. Stir in tomatoes, stock, milk, cauliflower, potatoes and drained chickpeas. Season with salt and pepper, cover with lid and simmer on low heat for 20 minutes or so, until chickpeas and vegetables are tender. Serve on warm plates sprinkling with a parsley on top.